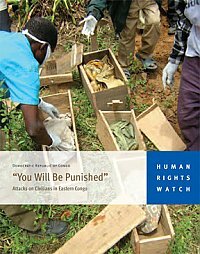 A United Nations-supported military offensive in eastern Congo has led to more than fourteen hundred civilian murders this year by both Congolese troops and rebels according a Human Rights Watch report released December 13. 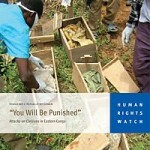 The report, titled “You Will Be Punished: Attacks on Civilians in Eastern Congo,” documents the deliberate killing of more than 1,400 civilians between January and September 2009. The killings occurred during during two Congolese army operations against a Rwandan Hutu militia, the Democratic Forces for the Liberation of Rwanda (FDLR). Many advocacy groups say that the UN peacekeeping mission in Congo has failed and must be reformed to protect civilians adequately. The situation is extremely violent, with various rebel groups supporting their operations with proceeds from stolen minerals. The area is rich in resources such as gold, diamonds, copper, tin and the metallic ore coltan, used in the manufacture of cell phones. The report was issued as the Security Council prepares to vote on a renewal of the peacekeeping mission mandate of United Nations Organization Mission in DR Congo (MONUC) on December 21.